Gregory Berns, MD, PhD is the Distinguished Professor of Neuroeconomics in the Psychology Department at Emory University, where he directs the Facility for Education and Research in Neuroscience. Dr. Berns graduated with a bachelor's in physics from Princeton University, received a PhD in biomedical engineering from the University of California, Davis and MD from the University of California, San Diego. He is the author of the New York Times bestselling, &quot;How Dogs Love Us: A Neuroscientist and His Adopted Dog Decode the Canine Brain&quot; (New Harvest, 2013). Early in his career, Dr. Berns pioneered the use of brain imaging technologies to understand human motivation and decision-making. In 2011, however, he launched the first effort to apply these tools to understand the canine mind. Now, he uses MRI techniques to study the brains and minds of a wide range of animals. He has received numerous grants from the National Institutes of Health, National Science Foundation, and the Department of Defense and has published 70 peer-reviewed original research articles. The company he co-founded, Dog Star Technologies, is one of only two companies to receive a contract from DARPA to develop canine brain imaging to improve service and working dogs. Dr. Berns' research is frequently the subject of popular media coverage including articles in the New York Times, WSJ, and Los Angeles Times. He has been profiled on ABC's Primetime, CBS's Sunday Morning, CBS Morning Show, World News Tonight with Diane Sawyer, NOVA, and 60 Minutes. 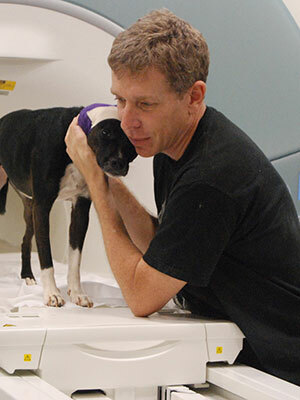 The use of functional magnetic resonance imaging (fMRI) has been a foundational tool of human cognitive neuroscience for decades, but its application to animals, has, until recently, required anesthesia and restraints. Dogs, however, are readily trained to the MRI environment. For the first time, this allows cognitive neuroscience of the canine brain in an awake, relaxed state. Canine fMRI experiments can be divided into passive and active tasks. Passive tasks focus on mapping different perceptual systems of the canine brain and include responses to simple and complex visual stimuli (e.g. colored shapes vs. faces), auditory stimuli (sounds, voices), and olfactory stimuli (simple volatiles, biological odors). Passive tasks do not require the dog to do anything except remain motionless. In contrast, active tasks involve the elicitation of a response or a trained behavior. Active tasks present unique challenges because of the potential confound of subject movement. However, when the dog is trained to move only on cue, the movement artifacts can be delayed in time from the salient neural events. Examples of this approach include response inhibition and delayed match paradigms for memory. Many of these neural measures are found to correlate with out-of-scanner metrics of personality and behavior, and may eventually be used to predict a dog's suitability for specific working roles.